One of the common terms frequently used in kayaking (sea kayaking and whitewater kayaking) is "Hip Snap." I still remember when I first heard the term. I was practicing my roll in the campus pool (self taught roll). My success rate was about 50%. I did a lot of muscle up rolls. While I was practicing, my friend Lee Carter came by to tell me about the whitewater kayaking class he just completed in the Sacramento area. When he saw me trying my roll he said, "They taught me to roll in the class." The key, according to Lee, was hip snap. I asked what hip snap was and he directed me to the side of the pool. Since I taught anatomy & physiology at the college level I was intrigued, because I had never heard of a hip snapping. I went to the side of the pool and followed Lee's simple directions. I tried this hip snap thing a few times while hanging on the side of the pool. Then Lee told me to use hip snap when I tried my next roll. I set up for the roll and went over. I started to sweep the paddle as I had done many times before. This time I did a hip snap while sweeping my blade near the surface. The results were amazing. Not only did I come up, I had so much power coming up I went over the other side. I recall laughing as I went over. I set up again and rolled up with the hip snap, but I used a little less power in my sweep. This time I didn't overshoot my mark. My roll had never felt so good. After practicing a few dozen more rolls, with hip snap, I felt like the previous boundaries I had were now lifted. As I continued in my kayaking career, I came to learn that hip snap was the essential component to rolling and bracing. 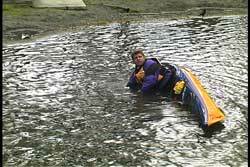 The part of the movement of the hip snap was the same movement used for edging a kayak too. So, if you ever want to learn how to roll and develop reliable bracing skills you will need to learn and master the hip snap. We will begin sitting in our kayak right side up. Our knees, thighs and trunk muscles are going to be the key to performing a hip snap. We will also be using the thigh braces attached to the cockpit coaming. To start learning the basic movement needed for a hip snap, lift one of your knees up to the thigh brace. As you do this, relax the opposite leg. You also want to keep your balance over the the kayak as you lift that working knee. As you do all of this you will see you kayak move onto its edge. After you edge your kayak to one side, try switching the working knee. If you lift the opposite knee and relax your original knee your kayak will edge up on the other side. Try rocking your kayak from side to side by alternating your knee lifts. 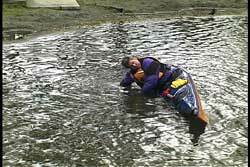 Remember to keep your body centered over your kayak or a capsize will be in your future. This knee lift exercise is a base for your hip snap. When you are ready to try the full hip snap, grab the edge of a pool, your partners bow, a low dock or head to the shallows. You need to capsize until your kayak is resting on you, but your head is still above water. Your goal in performing the hip snap is to move your kayak off of your body by lifting the lower knee up into the thigh brace while throwing your top knee away from its corresponding thigh brace. The hip snap movement is a quick one. The snap is referring to the quick motion. Since the action looks like it is happening around the hip area the creator of the term came up with the phrase "hip snap." For you purists out there, the hip is technically a joint. The hip joint is not righting your kayak. A more accurate name would have been "knee lift, knee throw, body crunch snap." However, by the time you would have given this direction to your student, they would be upside down and out of air. That is why hip snap caught on. Start by doing the movement slowly to get the feel of how to do it. Once you know the movement, start trying to do it faster. When you perform the hip snap, you want to keep your head down. When learning the hip snap movement you are not trying to right your body. Your goal is to move the boat off of your body quickly. This is an important point. The hip snap is only one part of the process for getting you back over your kayak. The hip snap is just the movement to right your kayak. While keeping your body capsized, flip the kayak off of your body and then bring it back down again. You are moving your knees alternately up into your thigh braces, along with using your trunk muscles to right your kayak and bring it back down again. When you do perform a hip snap for a roll or a brace, you are just righting the kayak. The core concept you need to ingrain into your mind and body is to first right your kayak, then recover your body. That means leaving your head and body down when you hip snap your boat upright. Unfortunately bringing up the body last is counter intuitive, which makes it difficult for some to learn to roll. As you can see in the picture, it is natural to come up head first. Even though leading with the head feels natural, the action of leading with the head and body actually pulls the kayak back onto your body. When you attempt to come up head first, you have to pull up on the top knee to get your head up, which pulls the kayak toward the capsize. In addition, if you were to try the head first approach, you would need and incredible support to allow you to get up. I always let my students try the head first approach just to see how difficult it is to get up. It is very easy to strain something when trying to come up head first. As I mentioned earlier, there are two parts to getting upright. First is righting the kayak, which is done with hip snap. Second is recovering the body, which is a topic for another day. When you try to come up head first you are trying to right your body first rather than the kayak. 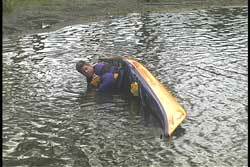 Reliable rolls and braces depend on righting the kayak first and then recovering the body. If you do the hip snap correctly and then follow with your body and head, the righting process feels almost effortless. A good way to test this is to try this while resting on your partner's bow. If you try the head first method without doing a hip snap, pay attention to how much you sink your partner's bow in order to get upright. Also feel how much effort and possible strain you feel during the righting process. 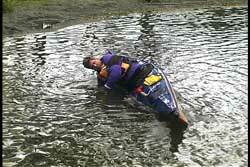 Then try it correctly, with a good hip snap to right your kayak first and then recover your body. You will notice that the bow doesn't sink much at all. After you have practiced the hip snap while keeping your head down, try the hip snap with your body and head following to get upright. I will say it again, the actions of hip snap and body recovery are the foundations for rolling and bracing. If you are successful with your movements, you should be upright with a smile on your face and without strains or pulled muscles. You should also understand that your hip snap can be affected by how you fit in your cockpit. If you have outfitted your cockpit to fit close to you body, your hip snap will be more efficient. If you are moving around in your cockpit, you can lose efficiency with your hip snap. A well fitted kayak moves with you. A nice bi-product of a good hip snap is the ability to edge your kayak. When you learn how to do edged turns, you will see the same muscle movements as your hip snap, but done slowly. After doing these exercises you can see that you are not snapping your hips at all. You are lifting your knees and using your trunk muscles to manipulate your kayak from side to side. If you want to take advantage of the features of a well designed kayak, incorporating your body in moving your kayak is essential. Learning the hip snap will help you toward that end. Even if you never plan to learn how to roll, it is worth your time to learn the hip snap. The more confident you are in manipulating your kayak, the more at ease you will be on those rough days. "Loose hips, saves ships", is a phrase I like to tell my students. 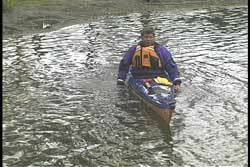 When the water is rough and your kayak is being bounced around, you will have a much easier time if you keep you hips relaxed and let the kayak move around underneath your body. I have seen a high correlation to good hips snaps and loose hip action. As I said at the beginning of this article, learning the hip snap brought me to another level in my kayaking career. If you like staying upright and want more performance out of your boat, then I recommend to learn the hip snap.